You can switch the preview window between the single mode and dual mode. Click [View] on the menu bar, and click [Single Mode] or [Dual Mode] to switch the preview window display between single mode and dual mode. This window is used to check clips. You can view clips in the bin window and sources being captured, and set In and Out points on this window. This window is used to check the timeline. You can view video on which effects are applied and composite video in real time. Display either one of the Player or Recorder on the preview window and use them by switching the display. Use it to create or save projects, manage projects or clips, output edited video, and exit EDIUS. Use it to add cut points, delete clips, and execute editing functions such as undoing, redoing, etc. Use it for display settings such as show/hide of windows, palettes, and functions, managing window layouts, switching dual/single modes, and full screen previewing. Use it for clip operations such as creating new clips, linking or hiding clips, starting up layouter, configuring [Time Effect] settings, etc. Use it for settings of markers such as adding/deleting markers or importing/exporting marker lists. Use it to set editing mode such as trim mode and multicam mode. Use it to start up the [Capture] dialog box or [Voice Over] dialog box, to select devices, etc. Use it to render the clip being edited in various methods. Use it to start up tools such as Disc Burner, MPEG TS Writer, Mync, etc. Use it to open setting menus such as [System Settings] where you can set project presets and hardware device presets, [On Screen Display] where you can set timecode display, [User Settings] where you can set [Keyboard Shortcut], etc. Use it to display online manual or perform user registration. This window is used to play back or edit a source clip. If a device preset is assigned as an input preset, you can display the device preset simply by clicking. Set the In (start) point of the source. Set the Out (end) point of the source. Each click switches the playback speed in the reverse direction between 4 times and 12 times. Each click rewinds one frame at a time in the reverse direction. Keeping this button clicked plays back the source at the normal speed in the reverse direction. In the case of deck operation, frame reverse is performed. Play back the source in the forward direction. Clicking this during playback pauses playback. Clicking it again resumes playback. Each click forwards one frame at a time in the forward direction. Keeping this button clicked plays back the source at the normal speed in the forward direction. In the case of deck operation, frame advance is performed. Each click switches the playback speed in the forward direction between 4 times and 12 times. Repeatedly play back between In and Out points. Insert and place a clip at the position of the timeline cursor. 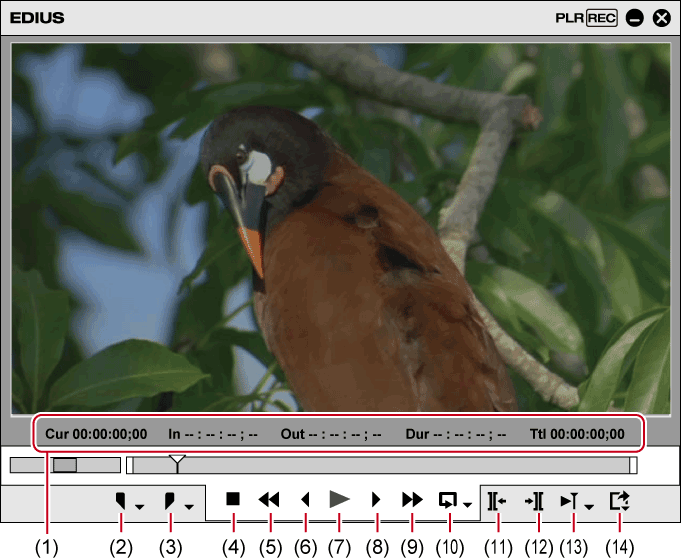 Overwrite and place a clip at the position of the timeline cursor. Register the clip displayed on the Player to the bin. Copy the range between In and Out points set on a clip as a subclip and register it to the bin. A subclip refers to the same source as that of the original clip (master clip). This window is used to play back the timeline or edit a clip. Display the current playback position, In point, Out point, duration, and the total length of the source data in timecode. Each click rewinds the timeline one frame at a time in the reverse direction. Keeping this button clicked plays back the source at the normal speed in the reverse direction. Play back the timeline in the forward direction. Clicking this during playback pauses playback. Clicking it again resumes playback. Each click advances the timeline one frame at a time in the forward direction. Keeping this button clicked plays back the source at the normal speed in the forward direction. Repeat playback between In and Out points of the timeline. Loop playback of the entire timeline can also be performed. Display output (export) related menus.